Our sundial is one of the finest in the county and yes, it still works!. The hours have a line radiating from the top of the gnomon (the brass bit), and are divided in the border into quarters. Read the dial using the shadow cast by the upper edge of the gnomon, the straight edge, not the one with the curlywigs. The "four" in the Roman numerals is IIII rather than IV; this feature is common among Cornish dials. The scale begins (top left) at a little after six (VI), and it ends (top right) just after six in the evening. The calendar feature on the dial is more useful. It uses the seasonal changes in the general height of the sun to send the shadow of the nodus up and down. Every day the nodus point will sweep across the dial from left to right along a curvy line, but the line is slightly different each day and it ranges over the whole network in the course of a year. These daily tracks work their way down the face of the dial over a six month period starting about Christmas, retreating back up over the same ground during the second half year. The lines marked are not for a conventional monthly calendar but for the celestial zodiac which conventionally begins with Aries in March, at the Spring Equinox. The symbol looks like a pair of ram's horns, on the left of the only straight line among the curvy set running across the slate. Below that are the lines for the start of Taurus, Gemini, etc., down to the bottom, which line shows the sun to be at its highest, making midsummer. From Cancer the crab on the bottom line, six further jumps take you up on the right, passing the straight line again but this time for the autumn equinox (sign of Libra), up to the top line where the winter solstice (just before Christmas) bears the sign for Capricorn. Lastly, the signs on the left take the year and the sun's declination back down to where we started, ready for the start of a new astrological year. 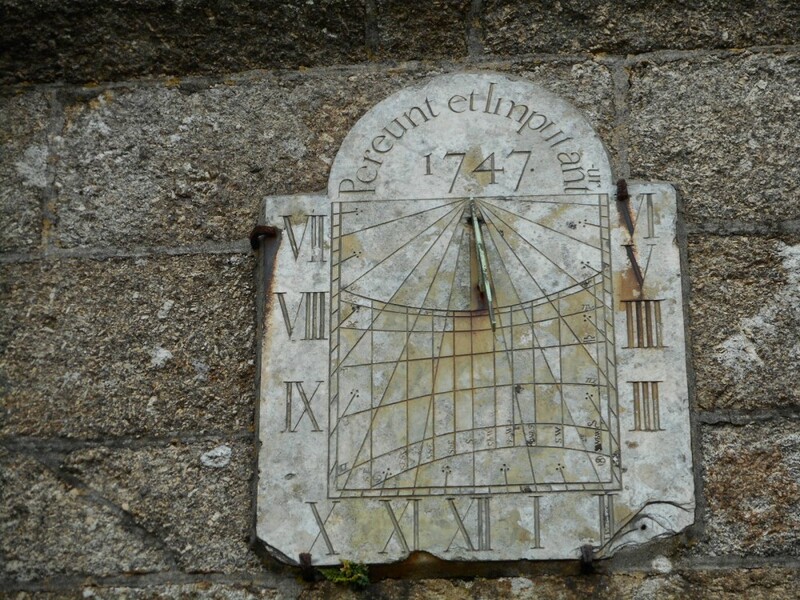 No other Cornish church dial has the inscription 'Pereunt et Imputantur'. It translates directly as 'They perish and are recorded', though as well as the cold listing of the names of the departed there is a sense of reckoning-up and evaluation. It reminds us of the awesome Day of Judgement to come, and presses us to use properly such time as is left. The craftsman hasn't signed his work on the dial face, which is unfortunately characteristic of most Cornish dials. He was a good carver, but possibly not altogether literate, from the mistake in the motto. He evidently mistook the length of the word Imputantur and had to tack on the omitted syllable, which is more likely to happen with those who can't read well and have accordingly to mechanically copy letter by letter from a pattern. Acknowledgment is due to Len Burge of Truro for this extract from his Landsender article on the sundial.